The squeegee technique was made famous by the German artist Gerhard Richter, who was professor for painting at the Art Academy Düsseldorf from 1971 to 1993. His works are the most expensive of a living artist in the world art market. The auction house Sotheby's 2015 had auctioned his painting "abstract image" for 41 million euros. A squeegee is ultimately a scraper or scraper rubber in any form and made of different materials. This can be a big wooden spatula with rubber lip, a large-surface spatula made of aluminum, as well as a small plastic spatula or simply a thick plastic film with which a color is wiped on. The works are often multi-layered and have a tremendous painterly density. Their color structures are slathered with brushes, squeegees and spatulas, which are pulled over the wet layers of paint, whereby existing ones are overlaid by new ones, torn or completely extinguished. You can thus highlight areas in your work and let others in the background. This creates a picture of the interplay of planning, coincidence and intuition. 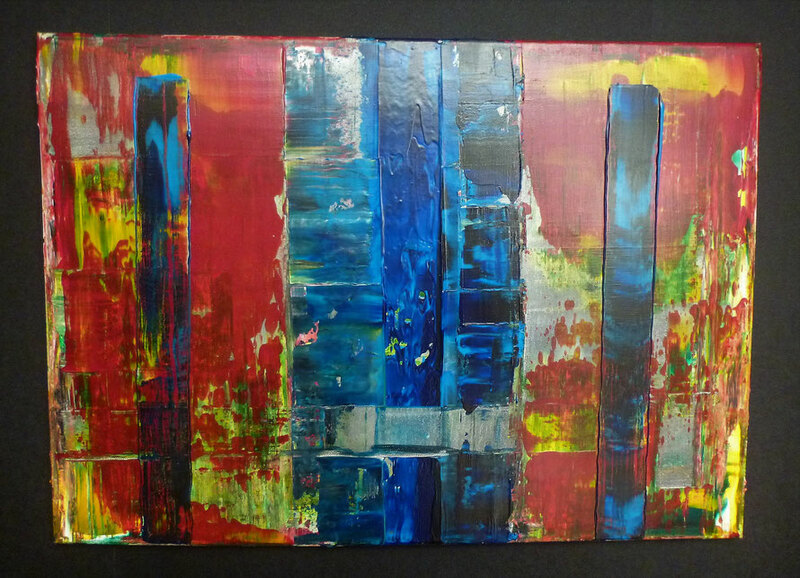 The principle of coincidence plays an essential role in this, since the application of paint when working with the squeegee technique has limited control. The composition of the colors and their layers, however, they are subject to precise planning, so to speak, the result of effects from a "very planned spontaneity". The stripping of the paint can be done in any way and at any time during the application of layers. By stripping the paint and the resulting color gradients or contours, the work gains a dynamic and depth. Even though the squeegee technique seems simple at first, it is still very difficult to express emotions through color composition, movement and structure. 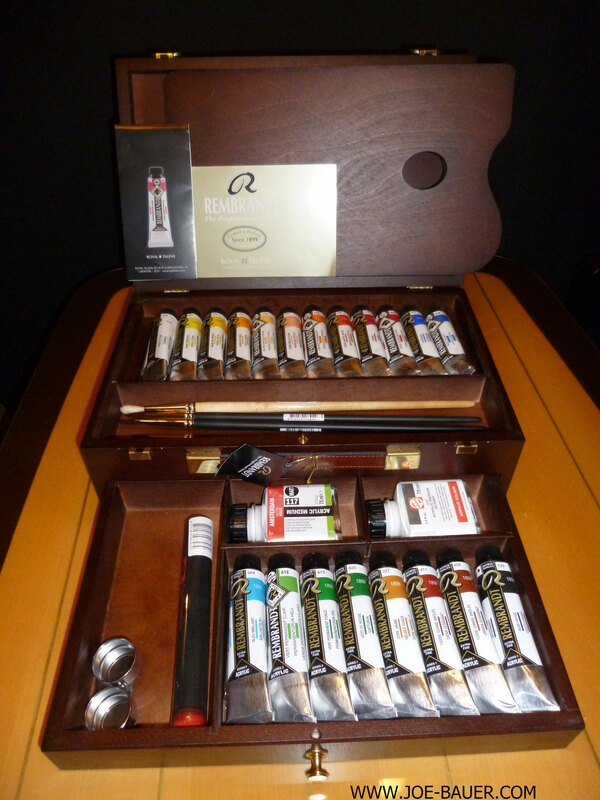 The colors used are normally oil paints or pasty quality acrylic paints. In this blog I would like to introduce you to the squeegee technique that I use for my works and try to limit myself to the essentials in short form. Detailed information on colors & tools, etc. I explain in detail in my other blog on this website "Basics Acrylic Painting" and do not go into this blog therefore further. MAKING-OF SQUEEGEE TECHNIQUE "PROJECT 202"
Please enjoy to subscribe for my YouTube channel, so that I can always keep you up to date about my information and videos (just click on the button below) - Thanks! 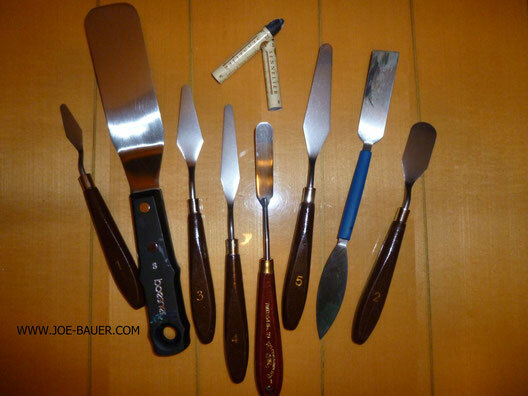 In addition to the following spatula / squeegee technique you need different brushes to apply the color and possibly primer to the painting surface (canvas, etc.). I prefer to use already primed canvases on which, with a wide brush, the first colors are applied. For the squeegee technique, the use of oil paints or pasty quality acrylic paints is recommended. I use only high-quality acrylic artist’s colours and get along with it very well. 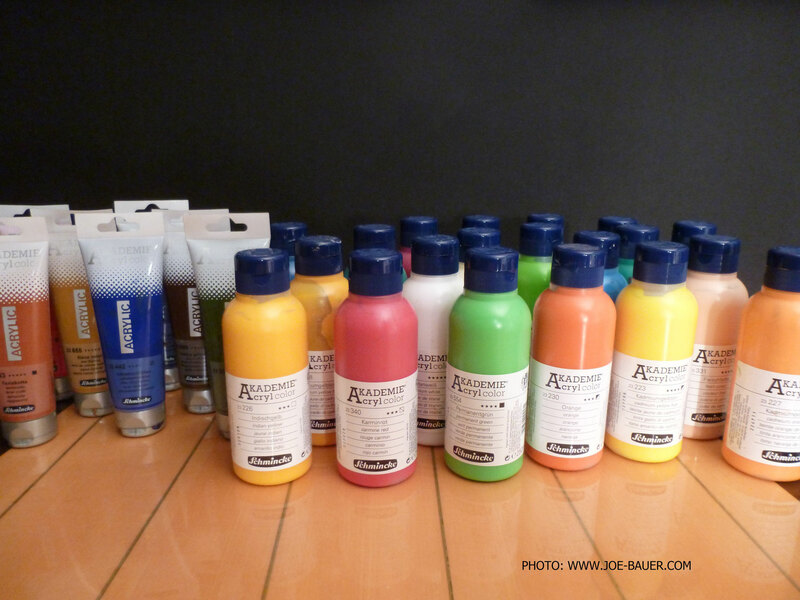 I like to work with the product AKADEMIE Acrylic Color - colors by the German brand Schmincke or the Rembrandt colors for example. 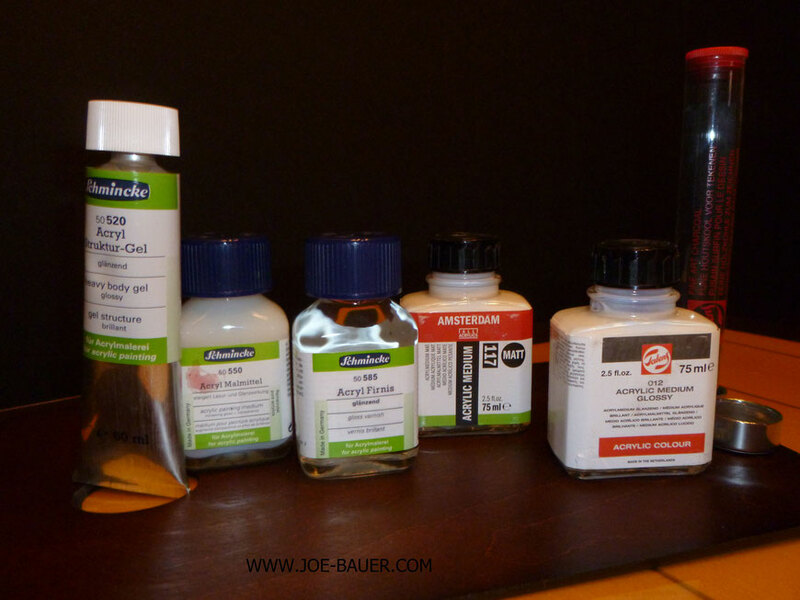 The addition of Liquitex pouring medium to the colors of the first color layer and the multi-layer paint application in a row allows me to control the drying time of acrylic paints very well. The fast drying time of the acrylic paint can also be extended by the addition of drying retardants. There exist a lot of possibilities to mix your colors with different additives. Schmincke - acryl "heavy body gel" - Strong pasty consistency; dries clear and forms a glossy, flexible, resistant film - ideal for transparent or translucent structures also in thick layers. 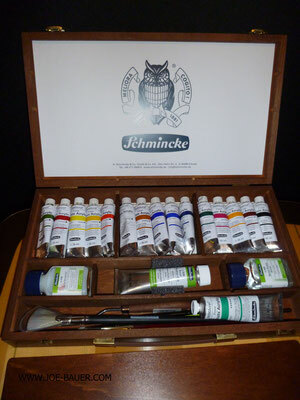 Schmincke - "acrylic painting medium (increasing glossy + transparency)" - enhances the translucent and gloss effects while additionally improving their adhensive properties. Ideal for layer painting. Amsterdam - "acrylic medium 117 matt" - makes the color more transparent. Reduses the degree of gloss. Talens - "acrylic medium glossy" - thinning acrylic colours whilst allowing sufficient binding agent. As a painting ground I use a taut stretched multi-primed canvas with a minimum weight of 300g / m² because I use a lot of paint and several layers of colors and the work can be correspondingly heavy. Due to the weight, the canvas could tear. Preparation: For all color layers, first select the colors and auxiliaries, so that you can work quickly and concentrated later. Avoid unwanted drying times in between. 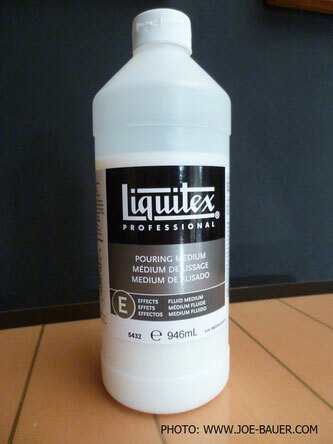 First paint coat: Mix the first acrylic color selection for the paint base with Liquitex professional pouring medium (e.g. 80% Academy Acrylic color - paints from Schmincke / 30% Liquitex) and apply with a wide brush slowly, opaque. (Possibly - let it dry a bit). Second coat of paint: e.g. Apply one or more colors directly on a thick PVC clip folder (office supplies) and carefully wipe / cover over the first coat of paint. Use different speeds when wiping to create different structures. Third color layer: like second color layer. (Possibly - let it dry a little or not). Now carefully remove deeper layers of paint with a squeegee / spatula. Be careful when using the Japan spatula, as it is very sharp and you can be very quick in reaching the canvas-underground. Note that due to the different opacity (translucent, slightly translucent, slightly opaque, opaque), the colors may still change. Depending on the thickness of the paint, allow the work to dry out for 1 to 3 days. If desired, then protect the work with varnish (matt, satin matt, or glossy). Varnish is applied by brush thin and evenly. I usually take the varnish from Lascaux which can be applied very well. Preparation: For all color layers (selected per each color layer) put the colors and tools first, so that you can work quickly and concentrated later. First coat of paint: Apply one color / several colors directly to the outer edge of the canvas and carefully spread across the canvas evenly or unevenly with a squeegee / spatula. Apply one or more colors directly to the squeegee / spatula and then paint the color composition directly onto the base. 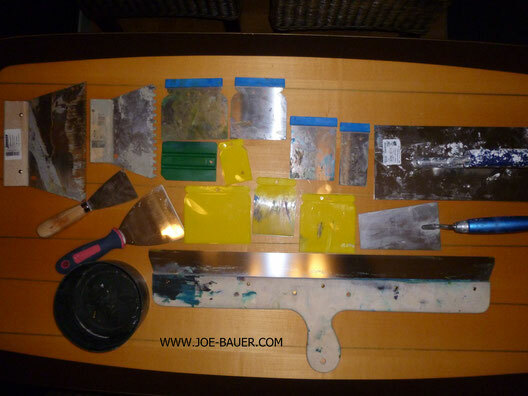 That's it ... it will be here with the scraper / spatula subsequently exposed no deeper layers of paint. After drying, apply the varnish. And now ... go on and enjoy working with the squeegee technique! BLOG "BASICS OF ARYLIC PAINTING"
Interesting links to blogs and articles on the topic "Squeegee Technique"